The company reported an adjusted $US0.64 earnings per share, and revenue of $US929.8 million, beating Wall Street estimates. Wall Street analysts were impressed by Fossil’s sales in wearables. View Fossil’s stock price in real time. The fashion designer reported adjusted earnings of $US0.64 per share on revenue of $US929.8 million, soaring past Wall Street’s expectations of $US0.38 per share and $US889.7 million. A Wall Street analyst said the company’s progress in wearables, and its intention to “transform into a smaller, more profitable company” has helped send its shares higher. However, he warned the wearables market is very competitive, making it a tough road ahead for Fossil. “Progress is starting to show in the numbers, but the crowded wearables landscape and weak wholesale traction make us question FOSL’s ability to grab top share [long term],” wrote Randal Konik of Jefferies, in a note. Sales of wearables grew 40% year-over-year during the quarter. For 2017, sales of wearables nearly doubled to over $US300 million, or 14% of total watch sales, the company reported. Konik raised his price target to $US16 per share from $US6. 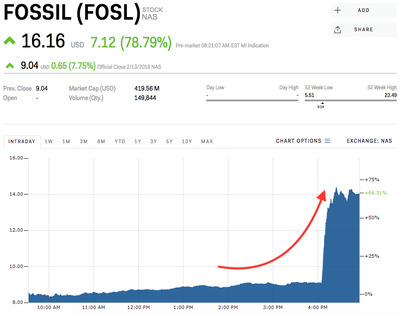 Fossil’s stock was up 83.82% for the year.